Consider an apartment whose monthly rent starts at $500, and every year it increases by 5%. 1. Complete the table below. 2. What is the rent at the end of the sixth year? 2. The ending amount for the sixth year was $670.05. 3. Why does the amount of increase keep changing? Each year the starting number grows, so 5% times that number grows too. 4. What was the overall percent change? 4. The dollar amount of the overall change was $670.05 − $500 = $170.05. Then we use the percent change formula which says percent change = change ÷ original, followed by RIP LOP to put the decimal format answer into percent format. percent change = $170.05 ÷ $500 ≈ 0.34 = 34%. Notice that if the increase had remained at $25 per year then the overall change would have been 6 years × 5% = 30%. The growth of the annual increases added up to an extra 4% overall change. We can simplify our table using the one plus trick. 5. 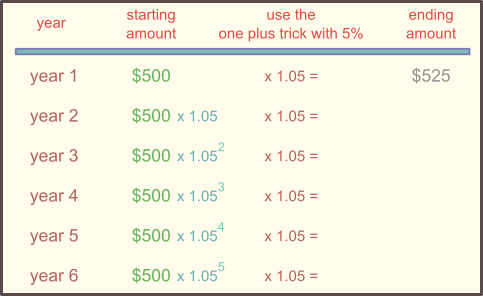 Complete the table again, this time using the one plus trick in each row. That was a lot nicer! Don't stop now! We can make the table even simpler! The year two starting amount of $525 was calculated using $500 × 1.05. What happens if instead of the dollar amount we put that calculation in the place of the year two starting amount? And keep doing that for every year's starting amount? 6. 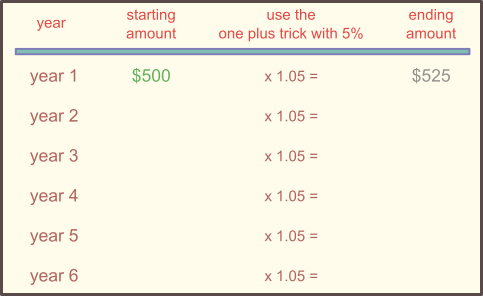 Complete the table below, using the initial $500, incremental exponents, and the one plus trick. That was the nicest of all! Now we have a table that shows us a pattern. 7. What is the formula for the ending amount y if we know the year number n? Interest is a fee the lender charges the borrower. For your savings account or a government bond, you are loaning money to the bank or government, and you collect the interest. For your debts, a bank or credit card is loaning money to you, and they collect the interest. The initial amount of a loan is called the principal. The fee is usually charged monthly. Each time the fee is charged is called a payout. By tradition, the fee is always written as an annual interest rate. That way all loans are easy to compare, whether the payout happen monthly as usual, or on some other less common schedule. 8. A loan has a 3% annual interest rate. Payouts happen annually. If the principal is $100, what is the dollar amount of the first payout? When payout happen more often than once per year, the annual interest rate must be divied up into equal size portions. A loan with monthly payouts would have a monthly rate equal to one-twelfth of the listed annual interest rate. A loan with quarterly payouts would have a monthly rate equal to one-quarter of the listed annual interest rate. 9. A loan has a 3% annual interest rate. Payouts happen monthly. If the principal is $100, what is the dollar amount of the first payout? Simple interest is when the fee remains the same with every payout. Its amount is fixed when the loan begins, and never changes. The most common real-life examples of simple interest are payday loans, bank certificates of deposits, and bond investments. The picture to the left shows loan with simple interest for which the borrower never makes any payments. The loan starts on the left side with only the principal (the blue bar). As time goes on we move to the right. 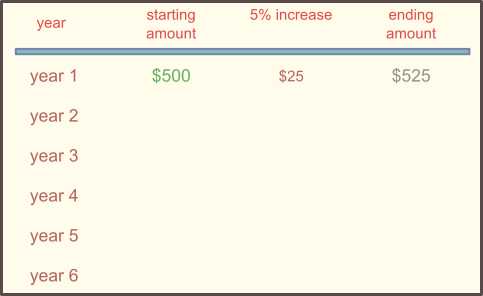 Each year a fee is added to the loan (each payout is a new green bar). All the green bars have the same height. The amount of the loan grows at a steady pace. If the first example above was simple interest then every year the loan amount would increase by a $3 payout. 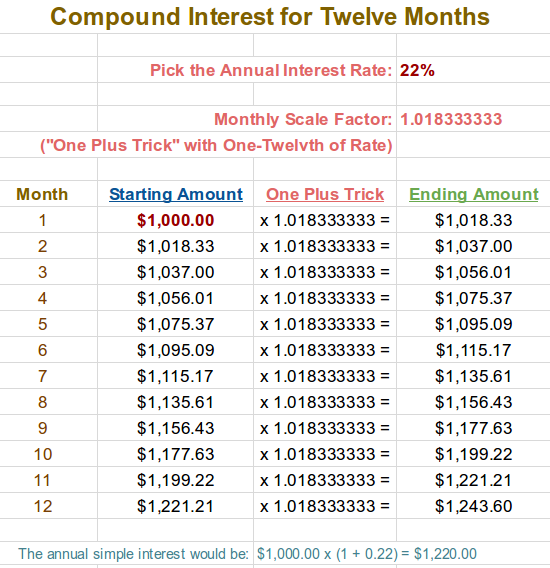 If the second example above was simple interest then every month the loan amount would increase by a $0.25 payout. 10. A loan has a 3% annual interest rate. Payouts happen monthly. The loan uses simple interest. If the principal is $100, what is the total amount of interest for the first two years? Wait a moment! We didn't need to divy up the year into months! It was a waste of time to divide by 12 with the rate, and also multiply by 12 with how many payouts. The example we just did highlights a very convenient truth! For simple interest we only need to find the total annual interest (principal × annual interest rate) and then multiply by the number of years. 11. A loan has a 3% annual interest rate. Payouts happen monthly. The loan uses simple interest. If the principal is $100, what is the total amount of interest for the first 18 months? Then we just multiply the principal, annual interest rate, and number of years. In other words, for simple interest we can be lazy and always pretend the payouts happen annually. If the payouts are actually monthly then we could divide up the annual interest into its twelve equal parts, but we would end up smooshing them back together when we found the total value of all the payouts. If the payouts are actually quarterly then we could divide up the annual interest into its four equal parts, but we would end up smooshing them back together when we found the total value of all the payouts. We can write this as a formula. But remember that it is not the kind of formula that is discovered by looking at patterns. It is merely the fact of how simple interest is defined. Unfortunately, this formula is traditionally written in a more confusing manner. Pleae be careful with this version of the formula! Remember that the interest it gives is simple interest. Remember that the rate is an annual interest rate that needs RIP LOP. Remember that the time is always measured in years and might need unit conversion if initially provided in days, weeks, or months. Be alert! (Snakes don't eat lerts.) So far all the problems asked for the amount of interest as the answer. Other problems could ask for the new total. 12. An loan has a 2% annual simple interest rate. The principal is $750. How much is it worth five years later? 13. An loan has a 5% annual simple interest rate. The principal is $400. How much is it worth 200 days later? Similar to interest is a concept called appreciation. This describes when an investment increases in value just because the investment is worth more after time goes by (not because a fee is charged). People often see appreciation in the value of their home, in the value of old furniture or jewelry, and in the value of the stocks in which they invest. The opposite of appreciation is depreciation, when something's value goes down. In a slightly confusing manner, people use the simple interest formula for both interest and appreciation/depreciation. Just pretend that the change from appreciation/depreciation is a fee even though it really is not. 14. Scrooge McDuck puts one million dollars into an investment that appreciates 3% its first year. The second year the investment depreciates by 3%. Scrooge is sad, and thinks he is financially back where he started. When his account statement arrives in the mail he is surprised to see that he has less money than he started with! What happened? $1,000,000 principal × 0.03 rate × 1 time = $30,000. $1,030,000 principal × 0.03 rate × 1 time = $30,900. Remember, that same 3% of a larger amount is itself larger! The English word "compound" means two different things. It can refer to an item made up of multiple and different parts (for example, a medicine that is a compound of ingredients). It can also refer to an item made greater by a certain type of thing (for example, strong winds compounding the difficulty of putting out a forest fire, or young siblings with a tendency to get into trouble that is compounded by their cousins visiting). Compound interest uses the word "compound" in both ways. Lots of parts make the loan a lot bigger. A loan that uses compound interest still has a principal amount, an annual interest rate, payouts, and an overall length of time. However, the payouts no longer stay the same size. At the moment of each payout, the annual interest rate is applied to the current loan size then. The picture to the left shows loan with compound interest for which the borrower never makes any payments. The loan again starts on the left side with only the principal (the blue bar). As time goes on we move to the right. The first year's fee is a percentage of the principal (the first and lowest green bar). Then things change. The second's year payout is based on both the principal (adding a second green bar) and the first year's interest (adding the first and lowest purple bar). In the third year there are four bars that contribute to the third payout. And so forth. The amount of the loan grows at an increasing pace, faster and faster. For simple interest we could be lazy and always pretend the payouts happen annually. Perhaps in real life there were several payouts that were evenly distributed throughout the year. The math allowed us to easily smoosh a year's worth of payouts together because they were all the same size. For compound interest we cannot be lazy. Every payout is a different amount! We must consider each of them individually. Here is a sample monthly compound interest spreadsheet. Why is the annual interest rate of 22% divided by twelve? 15. A loan has a 3% annual interest rate. Payouts happen monthly. The loan uses compound interest. If the principal is $100, what is the total loan amount after the first 18 months? Notice that this formula gives us the final amount. If we were asked to only find the interest, we would need to subtract away the principal. 16. A loan has a 3% annual interest rate. Payouts happen monthly. The loan uses compound interest. If the principal is $100, what is the total amount of interest for the first 18 months? 16. As with the previous problem we find that the total loan amount is $104.60. Compound interest is not especially significant with a small time span. If you look back, you can compare Example 11 and Example 16. Those are the same except that one is simple interest and the other is compound interest. Example 11 had $4.50 of simple interest. Example 16 had $4.60 of compound interest. Compounding earned an extra $0.10. There is not much difference when the principal amount and time span are small. However, with a larger principal amount and (especially important) decades of time the effect of compounding can be huge. Let's do two more problems to see it happen. 17. If Ms. Caruso invests $2,000 today at 9% annual simple interest how much will she have after 30 years? 18. If Ms. Caruso invests $2,000 today at 9% annual interest, compounded monthly, how much will she have after 30 years? With this larger principal and longer time span, switching from simple interest to compound interest makes a big difference! Most real-life compound interest with bank accounts and credit cards happens monthly. But there are other options. 19. 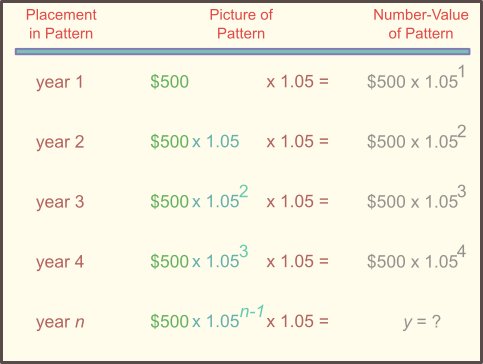 Complete this chart to explore various frequences if payouts. 19. annually = 1 per year, monthly = 12 per year, quarterly = 4 per year, weekly = 52 per year, semiannually = 2 per year, semimonthly = 24 per year, biweekly = 26 per year. Some people prefer a less generic compound interest formula. They do not mind have different versions if the formula for different time spans of compounding. As a concluding comment, the compound interest formula often does not apply to real life. Even though most loans do have compound interest with monthly payouts, there are also deposits and withdrawls. In real life it is rare to makes a single initial deposit or charge, and then passively watch the interest grow! We will deal with that more practical but complicated situation later. A special case of the compound interest formula happens when the principal is $1, the time for each payout is less than a year, and the number of payouts exactly fits a single year. This situation would measure how much compounding happens each year. In other words, there really is interest compounding during that year, but we are going to "summarize" the increase as if it were simple interest. Accountants call this the annual effective interest rate. We can write the normal compound interest formula for this situation. Then we make two changes. First, multiplying by $1 of principal does nothing, so we can leave that out. Second, we are really looking for the interest, not the final amount, so we subtract the $1 principal at the end. The number of payouts must fit a single year. 20. A credit card has a 24% annual interest rate. Payouts happen monthly. The loan uses compound interest. What is the annual effective interest rate? So this credit card behaves like a simple interest rate of 26.8% regarding its effect on your wallet! Go back and actively read these online lecture notes a second time. • Each time you get to an example problem, try to solve the problem yourself before looking at the solution. • If you get stuck, only look at the solution one line at a time. Either scroll down very carefully or hold a piece of paper over the screen to block the lower text. • If you are still stuck, contact the instructor or bring questions to class! Remember the three levels of math understanding. Reviewing the notes actively can work as prompt homework problems where the goal is merely to find out how much time you will need for studying and how to pace yourself—not yet to finish problems and master topics. 21. Calculate the simple interest on $500 invested at 14% annually for three years and three months. 21. Three years and three months is 3.25 years. 22. A business buys a copy machine for $300 by borrowing that $300 with a nine month loan of 15% simple interest. What is the total cost (the copy machine plus the loan's interest)? 22. Nine months is 0.75 years. Simple Interest = P × r × t = $300 × 0.15 × 0.75 years = $33.75. Then add back the principal to get the total. $300 + $33.75 = $333.75. 23. Someone borrows $5,000 for 120 days at 9.25% annual simple interest. How much interest must she pay? 23. This time we will simply plug in (120 ÷ 365) where the year amount goes in the formula. Simple Interest = P × r × t = $5,000 × 0.0925 × (120 ÷ 365) years = $152.05. 24. How much was borrowed at 17% annual simple interest for six months if the interest was $85? 24. Now we are solving for a missing P.
25. Now we are solving for a missing r. Three months is 0.25 years. 26. Dale buys a painting for $1,000 and its value increases to $1,030. What is the percent appreciation? Chip buys a share of a mutual fund for $100 and its value increases to $130. What is the percent appreciation? Why did the two items have different percent appreciation if they both increased by $30? 26. This is not a simple interest problem! There is no time measurement. We are only comparing two examples of percent change. The same total change is ten times more significant when the original amount is only one-tenth as big. 27. Oregon Senate Bill 1105 limits payday loan interest rates to 36% or less. Before that bill was passed, payday loans in Oregon often had interest rates of 120%. Nationally, payday loans can have interest rates as high as 7,000%. The average payday loan is a two-week advance on $350. How much interest would be owed on a two-week, $350 loan if the annual simple interest rate is 36%? 120%? 7,000%? 27. This time we will simply plug in (2 ÷ 52) where the year amount goes in the formula. 36% Rate: Simple Interest = P × r × t = $350 × 0.36 × (2 ÷ 52) years = $4.85. 120% Rate: Simple Interest = P × r × t = $350 × 1.20 × (2 ÷ 52) years = $16.15. 7,000% Rate: Simple Interest = P × r × t = $350 × 70.00 × (2 ÷ 52) years = $942.30. 28. If Dr. Julius invests $2,000 today at 8% annual interest, compounded quarterly, how much will he have after 30 years? 29. If Dr. Julius invests $2,000 today at 8% annual interest, compounded monthly, how much will he have after 30 years? 29. First we find the interest rate per payout. 0.08 ÷ 12 = 0.006666... To avoid rounding in the middle wejust put 0.08 ÷ 12 in the formula. More frequent compounding will earn more money for Dr. Julias, but not by a huge amount. 30. Blue Bank offers five-year certificates of deposit that pay 6.5% compounded quarterly. Red Bank offers five-year certificates of deposit that pay 7% compounded semiannually. Which is a better deal? If Rosa Klebb has $30,000 to spend on a certificate of deposit, how much would each option be worth for her at the end of five years? Red bank is a better deal. The income increases more from a higher percentage rate than from more frequent compounding. The result of the previous problem is not always true. Over a long time span, more frequent compounding might be more significant than a half-percent rate increase. If you are curious, use a spreadsheet to check how long a time span is needed for Blue Bank to be a better deal. 31. Mr. Largo invests $1,000 for seven years at 6% annual interest compounded monthly. Additionally, at the beginning of the fifth year she deposits an additional $2,000 into the account. What is the investment worth at the end of all seven years? Then it is the beginning of the fifth year, and the $2,000 deposit brings the current account balance up to $3,270.49. The account grows for years five, six, and seven (three more years). 32. In seven years you want to have $20,000 to buy a vacation as a retirement present for yourself. What is the present value of this gift if the investment you make today will earn 11% annual interest compounded semiannually? 32. Now we are solving for the principal. Notice how we divided both sides by 1.05514. That is legal. It is a single number. We can divide both sides of an equation by it to get P by itself. 33. If you gave a 20-year-old sibling a $100 wedding present and they invested it at 11% annual compound interest, how much would it be worth when they are 60 years old? 34. If you invest $1 for a year, with compound interest of 6% happening monthly, what is that annual effective interest rate? 34. Because of the monthly compounding we have an interest rate per payout of 0.06 ÷ 12 = 0.005. We have 12 payouts during the year. The compounding raises the effective interest to slightly more than 6%. Not hugely more, but it would become significant over time! 35. If you invest $1 for a year, with compound interest of 6% happening weekly, what is that annual effective interest rate? 35. Because of the weekly compounding we have an interest rate per payout of 0.06 ÷ 52 = 0.00115385. We have 52 payouts during the year. More frequent compounding does raise the effective interest even more, but only barely. It would take a long time for that change to become significant. That is why banks and credit cards stick with monthly interest instead of competing with each other by also offering options with weekly compounding. Each time you load the page these problems change! Here are Math 20 review problems about percent sentences. Each time you load the page these problems change! 43. A small business borrows $2,800 at a 20% annual simple interest rate. It repays the loan after 135 days. How much interest does it owe? 44. Joyce pays for a $900 payday loan for 18 days with a post-dated check for $907.55. What was the loan's simple interest rate? 45. When Mia entered kindergarten her grandparents started a college account for her. They deposited $2,000. That one deposit grew at 9% annual interest, compounded monthly, for 13 years. How much was the account worth at the end of that time? 46. Sir Topham Hatt invests $8,000 by letting that amount grow for 22 years in an account that earns 4% annual interest, compounded semiannually. At the start of the next year, he moves all the money into a different account for 35 years at 5% annual interest, compounded quarterly. How much is in the account at the end of all 57 years? 47. A credit card has an 18% annual interest rate. Payouts happen monthly. The loan uses compound interest. What is the annual effective interest rate? These homework problems test your understanding in a deeper way. You may turn in written work or choose to share your work in front of the class. Be prepared to defend your understanding when your instructor asks you another question or two about your work. 48. The rent for Apartment A increases from $600 to $630. The rent for Apartment B increases from $800 to $830. What is the percent increase for each? How does it make sense that an increase of the same dollar amount is in one case more extreme? 49. Leslie starts a new credit card that charges 24% annual interest per year to keep her bookkeeping simple when buying a $5,000 living room set. (She will use the card for nothing else. And how many credit cards does this woman have, anyway?) The credit card charges her one-twelfth of its annual interest rate each month. Leslie pays $700 per month until the balance is paid off. Make a table that shows how her monthly credit card balance decreases, and find her total interest in dollars. This last problem seems simple but does not fit our natural intuition. Its numbers rush into the wrong places in our heads! 50. As a birthday present, Janice receives a $50 gift certificate to her favorite restaurant. She invites two friends to join her for dinner there. She expects great service and plans to pay a 15% tip. Restaurant sales tax where she lives is 10%. What is the most she can pay for the food if she wants the gift certificate to also cover everyone's tip and tax?